Tucking in to another round of the freely flowing alcohol at last December’s annual Roald Amundsen Memorial Dinner at the Fram Museum in Oslo, there was only one recently published book any of my companions wanted to talk about: the poet-artist Nancy Campbell’s The Library of Ice. In a warming world, where every Sonny Jim is tweeting up a storm at their latest High Arctic disaster tourism lark, such exuberance manifests every couple of years and one must endure. Yet there were exclamations such as one has not heard since Barry Lopez’s Arctic Dreams in 1986 (also published by Scribner). All agreed that The Library of Ice marked a fundament, the first truly significant cultural signpost of the natural calamity racing at us. It would be facile to suggest that the work should have been directly linked to Lopez with a title such as Arctic Nightmares, because there is so much more at work here than disaster tourism. The author holds a key to not just a library but a whole associated archive and art gallery the likes of which few writers have ever been able to reveal. The story centers on the notion that “polar ice is the first archive” and proceeds to carry through the metaphor with a seemingly effortless display that ranges from Inuit mythology to Antarctic ice cores to artifacts in the Pitt Rivers Museum to the Olympic skating routine of Torvill and Dean (and yes, the latter discussion is absolutely transfixing). It is not effortless, of course, and instead the product of years of careful observation by a poet, writer, translator, sketch artist, and print artist of wondrous sensitivity. Visiting or doing research in the Arctic forces one into different categories of thoughts. Most of these, in order for us to make a living, we must discard, and fast. Campbell shows us what a mistake this is. Reading the peer notes of the first article on the Arctic I wrote some thirty years ago, one reviewer chastised it for sounding too much like Lopez. This puzzled me, as I’d spent the previous fifteen years trying to write precisely like him. But I took heed, rewrote, flattened, polished the science up and toned the flourish down, and so began a more or less dutiful slow crawl up the academic ladder. Along the way, as I jogged in a straight line down Archaeology Road without my beloved copy of Lopez’s River Notes, I neglected to properly record so many memorable scenes right in front of my eyes: the brilliant maritime archaeologist smoking a pipe while peddling a bicycle at walking speed on the rough dirt road outside of Longyearbyen so that we could have a proper chat about an expedition from the 1890s as I walked alongside, a scene as incongruous as Paul Newman flirting with Katherine Ross on that frontier bicycle in Butch Cassidy and the Sundance Kid. Or the many drift artifacts noted but unrecorded on beaches throughout the Arctic, like the German light bulb seen on the north shore of Danskøya, a fragile glass bulb carried to an Arctic shore a hundred kilometers from the nearest lamp (and probably 2,000 kilometers from the lamp it had once been fitted to), an unlikely survivor of forces that could kill a human in seconds. The Arctic both lifts one’s eyes to take in some of the planet’s most remarkable landscapes at the same time it presents small human connections that are easily ignored or quickly forgotten—while also making sure you maintain a weather eye (and a ready firearm) in case of polar bears. The Library of Ice, fortunately, never makes this mistake. No detail is lost or forgotten. It is, one could argue, the first great literature of the Anthropocene. If you don’t believe this, go to page 33, where a sentence concludes: “if humans are lucky, there may be more decades ahead.” Decades. If we are lucky. Thus chastened, we embark on a journey around the Radcliffe Camera to the Bodleian to uncover Robert Boyle’s History of Cold. One imagines John Thaw’s Inspector Morse drinking at The White Horse across the street—a crazy thought until, sure enough, Morse code makes an appearance later in the book. One searches for the many prophecies in this book just as when listening to the music in Morse, where the composer of the soundtrack, Barrington Pheloung, would telegraph the name of the murderer in code in each episode. The journey in The Library of Ice is undertaken by a poor pilgrim, with just a few quid for a drink and bed-sit, the very best of a miserable generation of academics bereft of proper positions or funding as the world inexplicably funnels buckets of cash upwards and away from renewable energies, digitization and democratization of archives, the preservation of indigenous lifeways, and a hundred other necessities. It is therefore an incredibly brave voyage, fearless in its way of postponing the inevitable reckoning of settling down to what used to be called a proper living to record another, larger, global reckoning. The brilliance of Campbell’s method is a stream of cultural connections tied to the theme of memory and loss: the architecture of the University of Greenland fitted to its surroundings, the ringing of the Terra Nova bell for tea and cakes twice a day at Scott Polar in Cambridge, the crafting the Resolute Desk in the Oval Office from the wreck of HMS Resolute in the Arctic. Not being an artist, I am not qualified to attest to the descriptions of the wide variety of styles and media employed by the author. But every note she strikes on the life of a library and archive rat rings true, with only one or two flat notes: 1921 being set in the 19th century, and Knud Rasmussen traveling “eastwards” from Greenland to trace the route of Inuit to Alaska. But these slips of the fingers do nothing to detract from an author who can range from Mylius-Erichson’s 1902-04 Danish Literary Expedition (scientists needed not apply) to the genius of Halldór Laxness, from the Battle of Vittorio Veneto (into which my own grandfather was drafted but thankfully never showed up, lest someone else undertake this review) to the labyrinth of the Prose Edda, and from Ötzi the Iceman to Vander-Molen’s utterly Vernian attempt to cross Iceland via the Jökulsá á Fjöllum river in an ultralight aeroplane in 1983. This latter expedition was so endlessly fantastic that it served as one of several inspirations that eventually sent me north. It was sandwiched between the 1979 publication of Roland Huntford’s Scott and Amundsen and its dramatization by Trevor Griffiths as Judgement over the Dead to its filming in Greenland as the luminous The Last Place on Earth in 1984 and the publication of Lopez’s Arctic Dreams two years later. How was anyone to avoid a scramble to the Poles with that cultural backdrop? Still and all, it does bring back another missed pathway: my major professor—a lovely New Zealander and renowned paleoanthropologist working on Pliocene stone tools—telling me way back in 1995 that I needed to apply my Arctic work to this new-fangled idea of global climate change. I do remember walking from his office and thinking that the old man was crazy: Arctic ice was as permanent as permanent could be. I couldn’t see where my work could be of any use on that score. Well. Twenty-five years later, as Ragnarök approaches, it is up to scholars like Nancy Campbell to record it all before the world melts and the old gods are defeated and washed away. 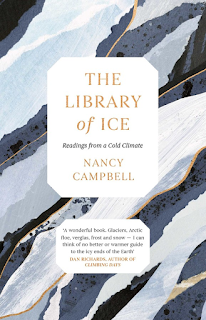 From behind her carrel in this Library of Ice, Campbell has brilliantly developed the theme of ice as both memory and loss of memory. Now, for goodness’ sake, someone get her a pint and a very large grant. That library’s almost gone and it’s not going to read itself. Looking forward to adding this to my collection of Arctic narratives. In accordance with US law, the Arctic Book Review would like to disclose that it (generally) is sent free copies of books for review by the publishers. No other favors or gratuities are received (or expected), and our reviewers receive no other compensation for their reviews.